LAST DAYS TO BOOK YOUR UNIQUE 'WILD GEESE' BICENTENARY TOUR OF TASMANIA, PARTICULARLY FOR THOSE WANTING TO CELEBRATE THE SUCCESS OF THEIR IRISH ANCESTORS WHO MAINLY, AS FORMER UNITED IRISH SOLDIERS, OVERCAME THEIR DEPORTATION FROM IRELAND AS CONVICTS IN THE 18th AND 19th CENTURY BY ESTABLISHING THE FORMER COLONY OF VAN DIEMEN'S LAND THROUGH THEIR HARD WORK AND ACHIEVEMENTS. THIS IS OUR FINAL INVITATION TO ALL THOSE PEOPLE INTERESTED IN OUR UNIQUE BICENTENARY CELEBRATION TOUR TO FINALISE THEIR BOOKINGS BY OCTOBER 18 SO THAT WE MAY ACHIEVE THE AMAZING LOWER COST OF $2,847 OFFERED FOR OUR 16 DAYS HISTORIC TASMANIAN TOUR WITH ACCOMMODATION, MOST MEALS, AND LAND AND FERRY TRANSPORT BY OUR BOOKING AGENTS, GROUPS TASMANIA. The Holt Family Fellowship has asked Groups Tasmania, to invite both the Australian and New Zealand Defenders', United Irish and 1848 Young Irelanders' descendants to join with the descendants of General Joseph Holt to honour their ancestors' contribution to the establishment of the Van Diemen's Land Colony and to celebrate the Fellowship's tenth anniversary with the bicentenary celebrations for Governor Macquarie's 1811 visit to Van Diemen's Land during which he had his United Irish surveyor, John Meehan, plan Hobart, New Norfolk and Port Dalrymple (Launceston). Our proposed 16 days bicentennial tour will be held from 18 November to 3 December 2011, the period covering most of Governor Macquarie's official tour. We also intend following General Joseph Holt's December 1805 agricultural survey of the Derwent River for the proposed re-settlement of the first Norfolk Island settlement's marines, convicts and free settlers in one of Captain Fell's antique ferries from Sullivan's Cove for our trip to New Norfolk, thus mirroring his journey, but in greater comfort. This was one of the areas that Joseph, with his former 1798 Co. Wexford, United Irish officer, Denis McCarty, discovered in 1805 and recommended for an agricultural settlement to Lieutenant Governor David Collins, having viewed the area from Pulpit Rock after voyaging there and to Alum Rock from Sullivan's Cove in the Lieutenant Governor, David Collins' whale boat. (Read his diarised account in Joseph in Van Diemen's Land). Norfolk Island's First Settlement was gradually abandoned for Van Diemen's Land during the period from February 1805 to 1813. The majority of the United Irish convicts were settled in the New Norfolk area on the Derwent River; the North Esk River where Richard Dry named his 30,000 acres farm, Elphin; and the South Esk. Elphin in Co. Roscommon, is the market town where Richard Dry was born. Launceston is situated where these two rivers join to form the Tamar River. In 1805, the new Norfolk Island commandant from Sydney, Captain John Piper, was aware that Joseph was an acknowledged 'cattle doctor' (veterinarian), both in his home county, Wicklow, and as manager for Captain William Cox in New South Wales. He placed him in charge of Norfolk Island's first shipment of livestock aboard the Sydney bound for Van Diemen's Land. Denis enthusiastically welcomed him ashore at Sullivan's Cove after the sheep and cattle had been unloaded. 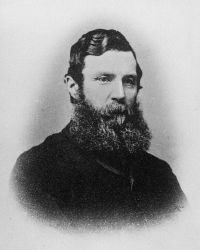 Lieutenant Governor David Collins was impressed by the good health of the livestock and requested Joseph, as a trained agriculturist, to carry out an agricultural survey of the Derwent River for the proposed resettlement of the Norfolk Island Colony. His previous successes as farm manager and land purchaser for Captain William Cox, after their arrival on the 11'th January 1800 in Port Jackson with their families aboard the Minerva were known to Captain Piper and had obviously been included in his despatches to Colonel David Collins who did not know him due to his earlier return from New South Wales to England as the former Judge Advocate and Secretary to Governor Arthur Phillip. Denis McCarty accompanied Joseph in Lieutenant Governor David Collins' whale boat on his survey. A few years later, Denis became one of the main progenitors for the establishment of the present day New Norfolk. It was one of the particular areas that they had recommended for Norfolk Island's resettlement. He built the first road to Hobart on the Derwent's north east bank and in 1811 organised New Norfolk's welcome to Governor Macquarie and his touring party. He was the first to send potatoes to Port Jackson as master of his own vessel 'Geordy' and followed this up with at least two more shipments, thus founding Tasmania's commercial potato industry. In contrast to the earlier penal colony attempts in New South Wales and Norfolk Island, it proved the success of England's plan, under Lieutenant Governor David Collins, to use the farming expertise of the United Ireland convicts to supply food from the Van Diemen's Land colony to the burgeoning colony of New South Wales. We will also visit the Elphin area established by Joseph's Society of United Irishmen Dublin Directory friend and former Defender leader, Richard Dry. He arrived on the 11th January 1800 in Port Jackson with Joseph Holt aboard the Minerva. He was sent to Norfolk Island where he was later to re-meet his friend, Joseph Holt. The two men obviously knew each other well. Joseph is known to have visited The Dublin Directory as their Leinster General several times to help plan their tactics in 1798. Richard returned to Sydney in 1805. In 1807, he left Sydney as storekeeper for Lieutenant General William Paterson's party to establish Port Dalrymple (Launceston) against the possibility of the French colonisation of at least portion of Van Diemen's Land, similar to the division pertaining to the continent of Europe. 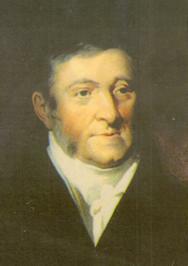 Richard was subsequently appointed Deputy Superintendent of Livestock there in 1808 by Lieutenant Governor David Collins following Joseph's 1805 recommendation. By 1822, he was also the Assistant Secretary of the British and Foreign Bible Society's Port Dalrymple branch. 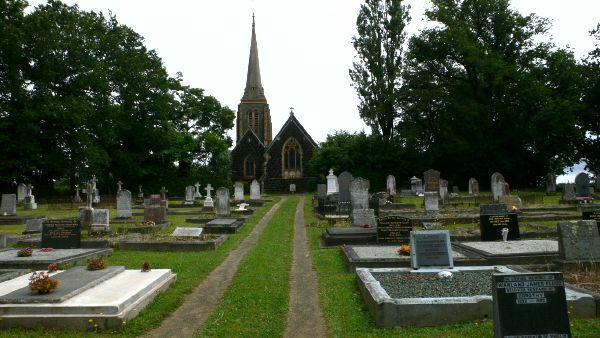 We attend the 9:30 AM Communion Service followed by a morning tea held by the parishioners at St Marys Anglican Church, Hagley, where the Dry family are buried and visit Quamby, both of which his elder son, Sir Richard Dry, established. The annual Waterloo Balls held there by Sir Richard became world famous. His younger brother, William, was the first native-born Tasmanian Church of England minister to be ordained and as such visited and preached at the Hagley church popularly known as Lady Dry's St Mary's Church. The first incumbent was Canon Irwin. 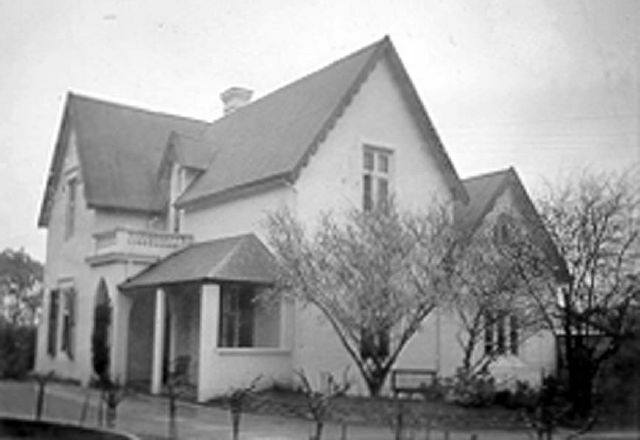 William's published 'Sermons' are held in the Petherick Library, National Library of Australia, Canberra, To re-establish itself in 1899, the Tasmanian Pastoral and Agricultural Society leased 40 acres from The Estate of Reverend William Dry. During his 1811 tour, Governor Macquarie granted Richard 500 acres of the Quamby Plains which he named, Belle Vue. Richard subsequently gave this property to his elder son, Richard Dry Jnr, who renamed it Quamby Estate. Richard Dry Jnr. was elected in 1866 as Tasmania's first native-born Premier and as such was invited by Queen Victoria to be her guest at Buckingham Palace where he became Tasmania's first Knight and one of the first men from what was now Australia to be knighted by her. "A fall from his horse in 1854 seriously affected his health."... "Towards the middle of 1869 Dry's health deteriorated and he died on 1 August 1869 at his Hobart house, Holbrook. His death brought unprecedented tributes of sorrow from all classes and his funeral cortege was followed by large processions through all the towns from Hobart to Launceston." (adbonline.anu.edu.au). It is hoped that we will be given the opportunity to visit the restored Quamby homestead, currently under offer, in which was held his famous annual Waterloo Balls. it is where the popular Australian actress, Kate Richie's recent wedding was held . Our golfers will be given time to play the magnificent nine-hole Quamby Golf Course, golf clubs will be available for hire. Our walkers will also be allowed to experience the magnificent scenery of the grounds. 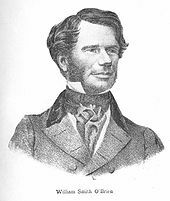 We will then follow the path of William Smith O'Brien one of the leaders of The Young Irelander movement. Fifty years after Ireland's 1798 insurrection, they tried to push ahead with the political aims and ideals of The Society of United Irishmen but unfortunately met with a similar end, thankfully without the previous War of Terror and its bloody carnage. We will visit the Van Diemen's Land 1833 Female Factory in the historic village of Ross which was established as the half-way point for the journeys from Hobart to Port Dalrymple (Launceston) and vice versa. We voyage from Triabunna the next day on the ferry to Maria Island where William was held on this island designed to mainly hold the political probationers. His attempted escape from Maria Island was revealed to the authorities by the ship's captain hired and paid by the New York Irish. A political prisoner like General Joseph Holt, he was then imprisoned as a convict in Port Arthur as a result of his escape attempt. His house there has recently been added to the Australian Youth Hostels' chain. 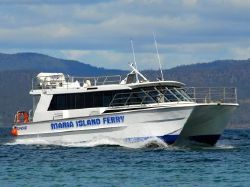 We will spend the morning and enjoy lunch on board our ferry as we visit Maria Island's painted cliffs by sea. On land, a National Park ranger will guide us on a tour of the historic convict era buildings and park during which we will visit William's former prison cottage and learn its interesting tale. Our hikers will also be free to enjoy their own tour armed with Maria Island park maps. 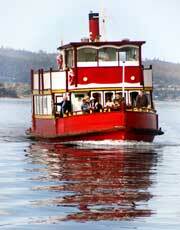 We then leave for Hobart to join in the Governor Macquarie bicentenary celebrations. We visit the Tasmanian Art Gallery to see the historic portraits of Governor David Collins, Richard and Sir Richard Dry amongst other notables, as well as early Hobart Town and rural landscapes. Time will also be allowed in the Tasmanian National Archives for our researchers to familiarise themselves with what it offers them for their family research, aided by their helpful staff. The next day our tourists will participate in a guided tour of Port Arthur and visit William's second cottage amongst other historic sites. We return to Hobart to join in the Governor Macquarie bicentenary celebrations on the 23rd November and the Saturday Salamanca Market before sailing on the Derwent River aboard Captain Fells' antique ferry in time to enjoy the New Norfolk bicentenary celebrations on the 27th November. We will be based here for five nights to allow us to tour the rich Derwent River hop-growing rural landscape with its picturesque oast houses, 19'th century Salmon and Trout Ponds with museum. We return to Hobart on the north east bank of the Derwent River using the highway built over much of Denis McCarty's original road overlooking the Derwent river as our farewell homage to the Defenders, The Society of United Irishmen, joseph Holt and his mates and The Young Irelanders. The next day we visit Bruny Island before we indulge ourselves with our Farewell Dinner at Mures Upper Deck Restaurant with its farewell views over Sullivan's Cove and where General Joseph Holt first landed with Norfolk Island's livestock. Due to requests, we have extended our original tour by two days to enable us to commemorate Joseph Holt's arrival at Sullivan's Cove on December 5 1805 with the first shipment of the Norfolk Island Penal Colony's livestock. We apologise to all those interested parties who have previously tried to register their interests with Harvey World Travel. They have suffered from a severe technical fault for virtually six months. It does not occur with our new agents, Groups Tasmania. We look forward to receiving further registrants, both from Australia and overseas. Please access our registration page and read our tour itinerary for further details. (Revised 1.October 2011).